This week, three members from our Community Development Programme, Joshua Friday, Thomas Hanson and Stephen Chapman were chosen to take part in the Tribal Warrior Corporations Maritime Training Program. The Tribal Warrior Aboriginal Corporation was established by concerned Aboriginal people with a view to spread and vitalise Aboriginal culture, and to provide economic and social stability. The purpose of the Corporation is to empower disadvantaged Aboriginal and Non-Indigenous people – encouraging them to become self-sufficient by providing specialised training programs leading to employment opportunities in the maritime industries. 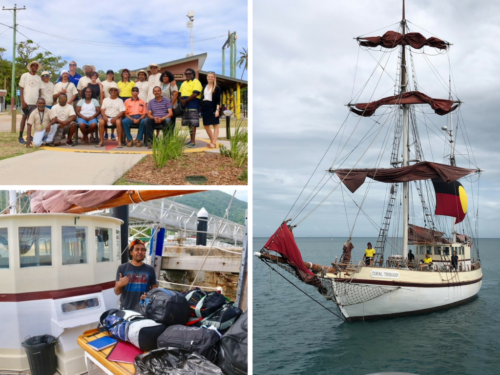 Our three lucky job seekers will participate in the training run over 14 days, involving 10 days sailing aboard the Coral Trekker and 4 days training back on dry land in Yarrabah. Through successful completion of the training, the participants will gain a variety of new skills and qualifications. The first qualification they will be accredited with is the General Purpose Hand (GPH/Deckhand) which will teach survival, firefighting, safety, seamanship, communication skills and First Aid. This qualification will allow them to get a job as a deckhand or similar on commercial vessels. The second course they will be completing is the Coxswains Certificate II, which builds on topics learnt in the General Purpose Hand course. This course will teach them basic navigation, engineering, legislation, collision regulations, vessel handling, basic stability, radio communication, refuelling, and environmental considerations. The course will qualify them to skipper a vessel up to 12 metres in length, and up to 15 miles offshore. On behalf of all the staff from the Community Development Programme and Campbell Page, we want to wish Joshua, Thomas and Stephen the very best on this exciting adventure and in obtaining future employment. We would also like to extend thanks to Valentine Nona, who organised our job seekers to attend the training.